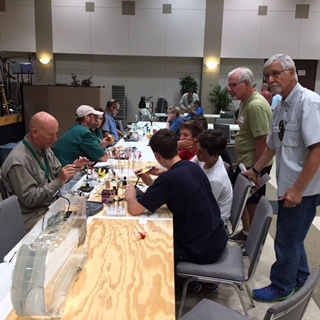 One thing about the membership of the Texas FlyFishers is that they turn out in good numbers for the monthly meeting except for the month of August which historically has the lowest monthly meeting attendance of the year. There didn’t seem to be any particular reason that we could put our finger on for the poor turnout but, we would go from 70-80 members per meeting throughout most of the year to 20-30 members at the August meeting. So, in 2009, then Club President David Lemke began working on a plan to pick up the August monthly meeting attendance. After much discussion, David came up with the idea of a mini expo and, it wasn’t long before he proposed that instead of holding a typical meeting with a social hour, club business followed by a featured speaker we use this time to show off the club’s talent at fly tying, rod building, knot tying / leader building, casting demonstrations and information and personal experiences on fly fishing destinations in an exposition format. We would kick the meeting off at 6:00 pm, using the extra daylight for the casting demonstrations and offer food and beverages for those who were not able to grab a bite before the event. There would also be a drawing with more prizes than we would normally give away at a typical meeting. More importantly, we would encourage the membership to bring along the family and/or friends they felt would be interested in learning about the sport of fly fishing. The plan was presented to the Board of Directors and approved. The Annual Mini Expo as now going to be a reality. The first, and hopefully annual, Texas FlyFishers Summer Mini Expo was held on August 25th 2009 at Bayland Community Center, the same venue as our monthly meetings. 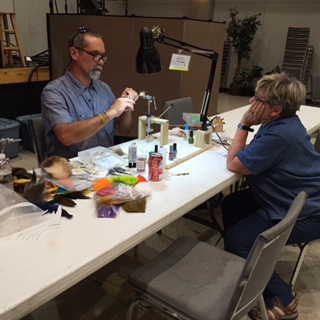 On hand, there were seven club members set up to demonstrate their prowess at tying bream & bass flies, saltwater flies and trout flies. Club member and rod building class instructor Joe Nicklo manned the rod building table, showing off some of the rods he and his students and constructed in the classes. Casting demonstrations and clinic were presented by club members David Lemke and Harry Crofton. Our member’s travel presentations covered destinations such as the Wind River in Wyoming, the Bighorn River in Montana, the Guadalupe River in the Texas Hill Country, fly fishing for salmon in Alaska, fly fishing in Iceland and fly fishing the South Platte River in Colorado. The only “imported” talent that night was Paul “Sodie” Sodamann of Flatlanders Guide Service in Kansas who taught his extremely simplified method of tying furled leaders or, “Doing the Twist” as he calls it. And, most importantly, Sandie Lemke oversaw the food trays and covered dishes brought by our members. This all went on without a hitch until just before 9:00 pm, when we closed the evening with a drawing for some great prizes. Puck ties a true fish catcher. 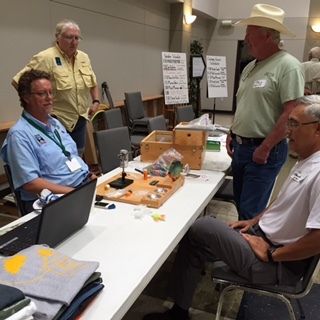 The attendance for the inaugural Summer Mini Expo was just short of 100 members, future fly fishers and curious onlookers, exceeding everyone’s expectations. With the success of the event, the die had been cast for this to become the club’s annual August meeting. 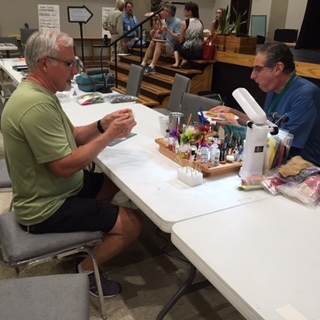 The format remained in place until 2014, when it decided to move the Summer Mini Expo from the traditional last Tuesday night of the month to a Saturday in the hopes of reaching more potential future fly fishers and maybe a new member or two. Each year since its inception, the Mini Expo attendance has continued to grow and we are looking for another large turnout at this year’s event. We all owe David a big thanks for coming up with and moving forward on his idea to add another premier event to the Club’s already impressive calendar. Guide Kevin Hutchinson talks about fly fishing Central Texas rivers.